This month, our littlest learners joined the proud ranks of regular library patrons on Chesapeake Campus. 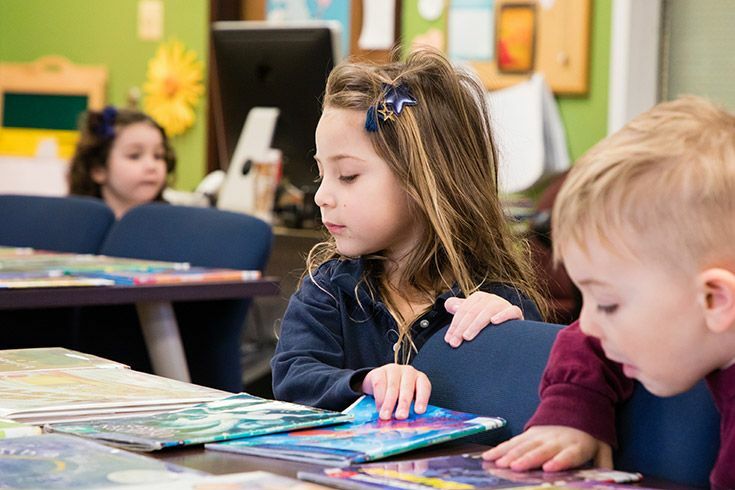 While early reading skills have always been a part of our Early School curriculum, our preschool students now visit the library each week for storytime, media literacy lessons and a whole lot of fun. 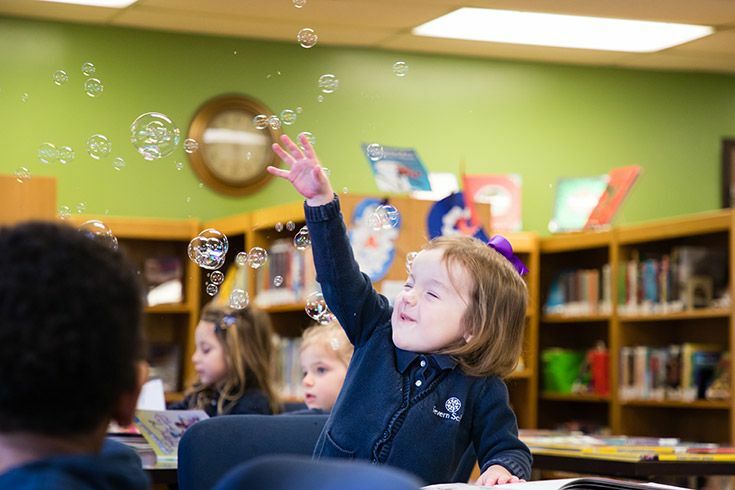 Right from the start, our students learn that the library is a welcoming place to explore their interests and the world around them through literacy-rich, hands-on experiences. 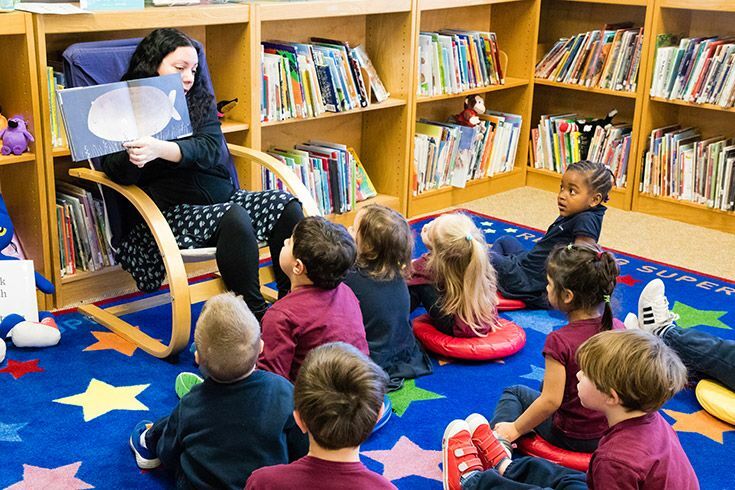 What Does a Preschool Library Class Look Like? 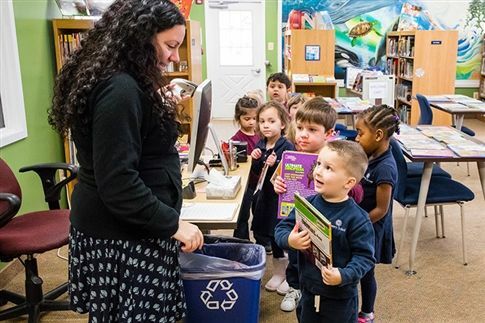 Lower School librarian Ms. Pilar Okeson introduces our early schoolers to the general concept of libraries; places full of resources to borrow and then return for others to use. She shows them where the books are, how to check out a book using the “magic wand” barcode scanner and where to return books when they are due. 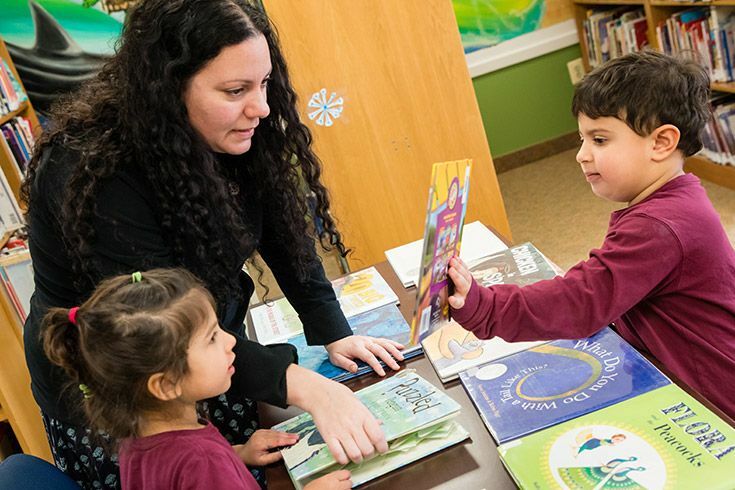 In addition to learning about how libraries function, our preschoolers navigate the differences between made-up stories and facts — the building blocks of media literacy. Throughout this process, Ms. Okeson uses examples that reach across a range of topics and genres. She reads aloud to each class with a contagious energy that makes every moment memorable. Her reading style is silly and fun, but there is purpose in every turn of the page. She helps our preschoolers practice early reading skills like moving from left to right and top to bottom on the page while using pictures to aid comprehension. While the kids giggle and follow along, they develop active listening skills and practice making comparisons and predictions. Can you tell what comes next from the picture? After storytime, our preschoolers choose a book to take for the week. 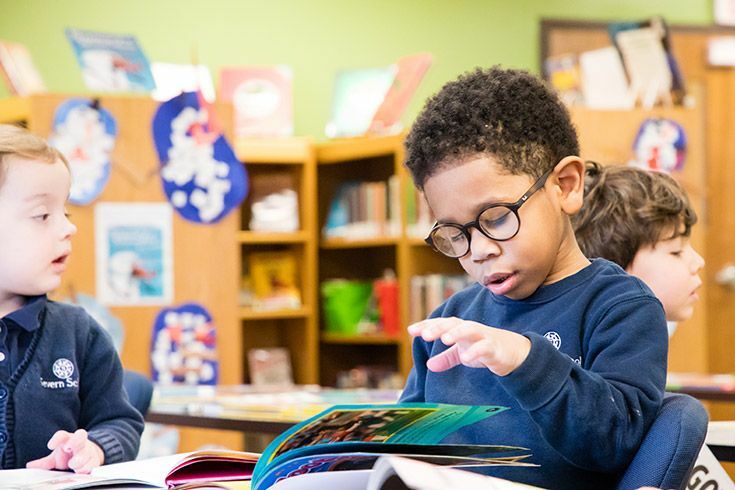 Ms. Okeson curates a new selection of books for every class, separating the fiction from nonfiction to reinforce what her students have learned about information organization. Ms. Okeson infuses even more joy into the day by blowing bubbles for the kids to play with and pop. At the end of the class, everyone lines up to check out, ready to explore their books and share at home before returning for the next library adventure. Time to read before check out. What Ms. Okeson values most about this time with her classes is the opportunity to develop strong relationships with every student. Each child is different with interests and questions that are uniquely theirs. Ms. Okeson takes the time to get to know their individual reading tastes, a window into who they are and who they want to become. Ms. Okeson offers advice on which book to choose. Since joining Severn School in 2015 Ms. Okeson has transformed the Lower School library into a vibrant space where every student and teacher is welcome, known and valued. She has developed a robust collection of resources for all developmental levels including our latest addition of Playaway Audiobooks. Every class visits the library weekly for lessons and activities that foster a love of learning and reading for fun. Each year she introduces creative library programming including the 5th-grade Battle of the Books, the 2nd-grade Adventures of Scaredy Squirrel weekly reading program, 3rd-grade field trips to the public library, yearly author visits and more. We can't wait to see what the library has in store for us next! Click the icon above to check out the Severn Stories news archive! Checking out books Severn preschool-style!